Archbishop Michael Neary, Archbishop of Tuam, will launch this evening a new online initiative and accompanying literature to promote vocations to the priesthood and religious life in the Archdiocese of Tuam. The theme of this initiative is ‘One Life, One Call, One Response’ and it will take place in Knock House Hotel at 8.00pm, the eve of the Feast of Saints Peter and Paul. It is now ten years since the previous campaign ‘Towards the Goal’ was launched by the Archdiocese of Tuam in 2000. This evening’s launch will include the promotion of posters, leaflets, prayer cards and a new website so as to encourage vocations throughout the Archdiocese. 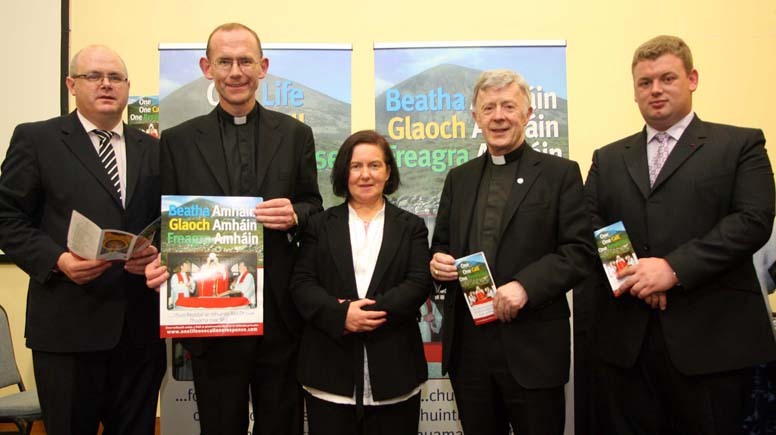 The Vocations Committee of the Archdiocese of Tuam will promote this new vocations initiative and literature at the annual vocations promotion on Reek Sunday, which takes place this year in four weeks time on 25 July 2010. 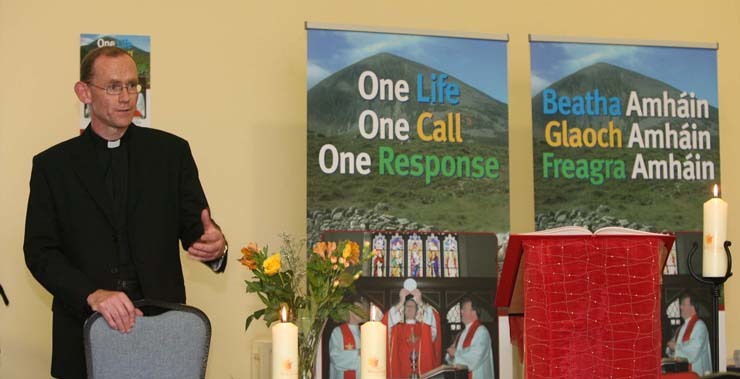 Welcome to everybody here today to the launch of the new online campaign and special literature for the promotion of vocations, One Life, One Call, One Response. Welcome to the lay-faithful, religious and priests. A special welcome to the Carmelite Sisters who have a special link with our vocations committee and are continually praying for priests. Welcome to parish representatives and members of the Diocesan Youth Council, the Council for the Laity, Saint Joseph’s Young Priests Society, Diocesan Pastoral Council and various representatives from the media. The theme of the launch is One Life, One Call, One Response. An African proverb states that when a tree falls it makes a great noise, but when a forest grows, it grows silently. All of us are deeply conscious of the failures, infidelities and crimes of which some priests are guilty. That, and the sometimes inadequate handling of these serious matters has been rightly exposed and has received considerable coverage. Yet in-spite of all of that priests will be found standing shoulder to shoulder with families and individuals who carry their crosses on life’s journey, whether it be death, tragedy, illness or separation. The priest accompanying them remains with them in the gardens of their Gethsemane. He is there at many key moments of profound sadness and joy in people’s lives.  Here in our own Archdiocese of Tuam our priests have been doing just that, providing a generous and supportive service which, in many ways, is heroic. The relationship between a people and their priest may be experienced in a very striking way on the occasion of the death of the priest, the celebration of a Silver or Golden Jubilee or the transfer of a priest to another area. Because we are a people formed, nurtured and sent on mission by the Eucharist, Vocation must be at the heart and core of who we are and what we are. The Eucharist which is central to our Catholic identity requires the priest. The priest is never a man on his own. As priests we emerge from, are supported, challenged and corrected by the people with whom we work and whom we endeavour to serve. The need for good committed prayerful priests is becoming more urgent. Despite the negative reports of recent times, in launching the Vocations material on priesthood, as a people of God we are declaring that we are very much open for business. We encourage, pray for and welcome vocations to priesthood. Here in the Archdiocese of Tuam we have so many dedicated, outstanding and hardworking priests, who have given so generously of their lives in service of Jesus Christ. In launching this material we are committing ourselves to a form of evangelisation, preparing the soil for the sowing of the vocations seed. One of the great obstacles facing us in this respect is discouragement but we must remember that discouragement never comes from the Lord. In the parable of the sowing of the seed in the gospels Jesus teaches us that all truly fruitful things begin in this world with what is small and hidden. Now is a particularly appropriate time to launch out into the deep, realising that we cannot do this on our own, the Lord is with us and will provide the catch in terms of vocations. In an age of anger and anxiety people look for and are entitled to find certain characteristics in their priest. Firstly they readily expect that their priest be a man of joy, a joy emanating from the fact that he is in contact with the God who created him to life, called him and to whom he endeavours to respond generously. Secondly, people expect the priest to be a man for others. This inevitably involves us along the road to Calvary and crucifixion. The words which we use at consecration: “This is my body, given for you”. Thirdly, people expect us to be men of prayer. If those three dimensions of priesthood are inter-related in our lives then others characteristics will emerge like courage, perseverance and passion. To all who contributed to the material. Canon Colm Kilcoyne for his help and advice with the text, Fathers Stephen Farragher, Ray Flaherty, Seán Cunningham and Shane Sullivan for their availability for the photographs and for the literature. The many people, baptised faithful, religious and clergy who contributed testimonials on the priesthood both in the brochure and on the website. A special word of thanks to the Vocations Committee, chaired by the Diocesan Secretary, Fr Fintan Monahan, to Fr Stephen Farragher, Tod Nolan, Krzysztof Sikora, Patrick Burke and Francis Mitchell who are involved in the schools promotion programme and the Reek Sunday promotion, to the Carmelite Sisters with whom the Vocations Committee have a special prayer link. To our seminarians, Eugene O’ Boyle and Shane Sullivan who please God will be ordained for our diocese in two years time, to Seán Flynn who has just finished Second Philosophy and Dominic Allen First Philosophy, and Aidan Gallagher who has completed is pre-seminary year in Valladolid. Thanks to Mary Connolly, our Diocesan Liturgical Resource Officer for taking charge of the prayer and liturgy tonight, to Liam Horan of Slí Nua Communications who designed the new Diocesan Website and acted as MC for the evening. To the media people for coming and for their kindness in supporting various events in season and out of season and to Knock House Hotel, a very suitable location for this launch. I hope that you all have a pleasant evening, a safe journey home and thanks again for your encouragement and support in joining us this evening. I now formally launch this new literature, One Life, One Call, One Response and pray God’s blessing on it that it will bear a rich harvest of fruit in abundance and plenty.